Engineers at the Department of Energy’s Pacific Northwest National Laboratory in Richland, Washington have beat nature by millions of years in turning algal glop into crude oil, cooking a “a verdant green paste with the consistency of pea soup” into oil, water, and a nutritious batch of byproducts. “Faster” means an hour or less, researchers having combined several chemical steps normally associated with bio-fuel production into one continuous process. Wet materials in this process reduce costly and time-consuming steps normally required to dry the algae. This simplification, among other steps, makes the process commercially viable. Admittedly small scale at this point, the process runs continuously, starting with about 1.5 liters of algae slurry each hour. After cooking the algae for 350° Celsius (662° Fahrenheit) at a pressure of about 3,000 pounds per square inch for about an hour, the process yields about 50 to 70 percent of the algae as crude oil, some clean water, and fuel gas. The water can be re-used to grow more algae and the gas can be burned to make electricity and power the process. It could also be used to make natural gas for use in compressed natural gas applications. 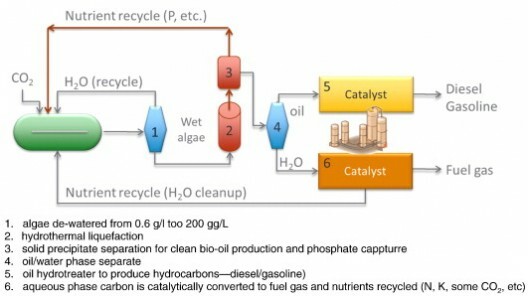 According to PNNL, the system is “not easy or cheap to build,” but “cost savings on the back end more than make up for the investment.” The process avoids the use of solvents such as hexane used in extracting oils from other algae-to-fuel processes, using hot water instead to convert the biomass to liquid and gas fuels. This doubtless reduces costs associated with toxic waste storage and disposal. No inclusive life cycle analysis has yet been undertaken, but the reuse of clean water and nutrients for growing fresh batches of algae would add to the overall economy of the process. The high temperatures and pressures involved, even for short periods, may be an offsetting factor In requiring large energy inputs. Obtaining the source algae is a low-energy process compared to drilling for and refining crude oil, though, and having that source at the point of production eliminates the costs of transportation to refineries associated with normal fossil fuel extraction and processing. The research team, including Douglas C. Elliott, Todd R. Hart, Andrew J. Schmidt, Gary G. Neuenschwander, Leslie J. Rotness, Mariefel V. Olarte, Alan H. Zacher, Karl O. Albrecht, Richard T. Hallen and Johnathan E. Holladay, published their paper, ” Process development for hydrothermal liquefaction of algae feedstocks in a continuous-flow reactor,” in the Sept. 29, 2013 journal Algal Research. High temperature / high pressure water is a renowned tool for chemical reactions. In the ’70s, it was used with injected oxygen as a way to “burn” rice field waste rather than burning it in the open. The high temperature and pressure would allow the water to absorb a tremendous amount of oxygen which would oxidize the waste, sustaining the heat and making the whole system energy producing without nitrous or other such byproducts. As such, there should be quite a bit of existing technology available for PNNL to help them move their research into larger production scale systems.